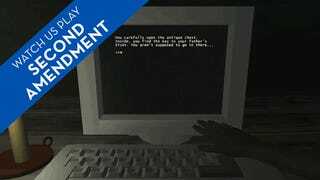 A few game developers decided that for some reason, Unity, the 3D game engine, is the perfect medium for a text adventure. Amazingly, it turns out that they were right. I'm not going to explain why, you should either play the game yourself (It took me about 7 minutes) or watch the four minute video version above. This is the future of interactive storytelling, people.